A recent tragedy in Ohio has been causing controversy about exotic “pets” and whether private ownership of these animals should be allowed or laws should be passed against it. If you have not heard about the incident in Zanesville, Ohio, here is a recap. On Oct. 19, Zanesville local law enforcement was called in to respond to an incident at a private residence where Terry Thompson had a menagerie of captive exotic animals. Responders arrived to find that Thompson had taken his own life after opening the doors to cages housing 56 exotic and wild animals. Police were force to shoot and kill the animals. 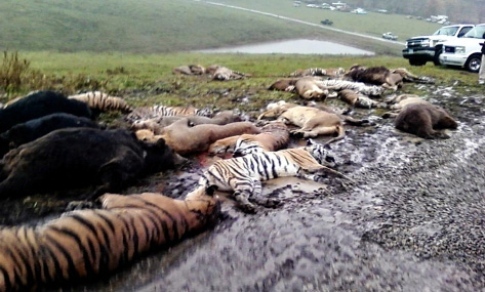 Forty eight animals were killed, including 12 lions, eight bears and 18 endangered Bengal tigers. Keeping wild animals as pets can not only be challenging and dangerous, but also cruel. By buying exotic pets, you are supporting the exotic “pet” trade business. In this industry, the animals are captured from their homes and suffer during transport. Many don’t make the journey or die prematurely from their environment. Wild animals do not lose their wild instincts when in captivity and if provoked can become very dangerous and may kill or harm their owners, or escape and harm or kill others. Reptiles and some other species often carry salmonella bacteria that is easily transmitted to humans. Although adorable as babies, wild animals can grow to be larger, stronger and more dangerous than owners may expect or can manage. Domestication of species of animals takes thousands of years and non-domesticated animals do not do well with people. Many animals such as big cats, primates and reptiles have attacked owners and other bystanders. Here is a comprehensive list of Exotic Animals Incidents from Born Free USA. Providing appropriate care for wild animals can be difficult. Although keeping wild and exotic animals as pets may be appealing to some, they have specific health, behavioral, and psychological needs that are extremely difficult to meet in captivity. Most wild animals need a living area that somewhat resembles their natural habitat and larger species need sufficient space. It can also be hard to meet thier diatary, as it can get very expensive. In most cases it is not only hard to meet the needs of these animals, but we still do not know their specific needs. Malnutrition, stress, trauma, and behavioral disorders are common in exotics kept as pets. There is little federal regulation of ownership of wild animals. The issue has been generally left to the state and local government to regulate. This means some states have laws against keeping wildlife as pets and some have no laws against it. In the state of Ohio there was no law regulating the ownership of Thompson’s wild animals. 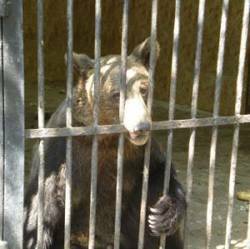 The tragedy in Ohio could have been prevented if Ohio had stricter laws on captive wild animals. Now Ohioans are calling for a ban on captive wild animals. But this isn’t an incident that only Ohioans should learn from, the rest of the country should also take note because it is not only dangerous and cruel for the animals, it is dangerous for people. Do not buy exotic animals from dealers or pet shops. Also, do not support private owners of exotic animals by visiting places like roadside zoos and backyard menageries. 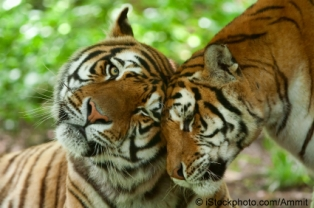 Support legislation that would make owning exotic animals illegal and prohibit the interstate of exotic animals.